Two recent reports offer very compelling arguments to address the social determinants of health as a societal priority. They also point to the important role public health plays as an advocate for healthy public policy more generally. The first, published in the British Medical Journal, is yet another piece of evidence that addressing socioeconomic conditions is good for health and an investment in social initiatives may be more effective at improving health than expenditures on health services. As the study points out: “Although most health reform efforts to improve health status focus on health expenditures, it may be that additional attention on social services is also needed. This approach is consistent with public-health frameworks, which have frequently highlighted the social over the biological and medical determinants of health”. Many public health advocates in BC have longed encouraged the Ministry of Health and health care leaders to argue for a more comprehensive approach to health care reform that would tackle poverty reduction and end the never ending increase in health care expenditures. Naturally, most health care leaders are reluctant to take this view when they feel the pressures and demands on the health care system. But it does not have to be an either/or approach. What is needed is a cross government or intersectoral approach where at least there is a common understanding of what priorities are needed and every sector makes its contribution. This approach was applied to the government’s now defunct “ACT Now” health promotion initiative aimed at the behavioural risk factors associated with chronic disease. And it is what has been called for in regard to tackling poverty in the province. It is clear from this study that intersectoral approaches are critical if we are to get the investments in place that will produce the results we need. In fact, it may be the only way forward to improve health and contain health care costs. We can all learn more about how to approach intersectoral work later this year as the theme of this year’s PHABC Annual Conference is on this very topic. (http://www.phabc.org/) . 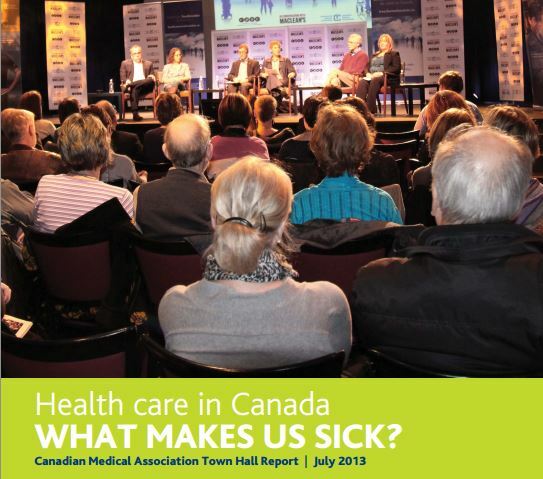 But when it comes to getting upstream of illness and truly tackling the root causes of the health inequities that drive so much of our health care expenditures, health care leaders have tended to stay silent – but not so much anymore as evidenced by the report and position now taken by the Canadian Medical Association (CMA). Most health care providers see the impact of poverty on health every day in their practices, but generally they feel helpless to act on it. Naturally there is a tendency to think governments will show the leadership to tackle these serious social problems. Or they defer to the efforts of their public health counterparts to “fight the good fight”. But the need for action by government is so pronounced that health inequities and their root social causes are now entering the mainstream of advocacy by organized medicine. While certain groups of physicians have been active in advocating for social justice and poverty reduction, this effort by CMA represents a major shift in thinking about the role of medicine in creating a new paradigm for health. As more partners like the CMA join the call of public health advocates for a broad approach to poverty reduction, food security and social housing, we will see the intersectoral approaches that are necessary to reduce health inequities – and ultimately slow down the rate of growth in health care expenditures. This entry was posted in Poverty and Health and tagged advocacy, Canadian Medical Association, poverty reduction, social justice by povertybadforhealth. Bookmark the permalink.